Lady Zoe Keane’s world is turned topsy-turvy when her aunt tells her that she is not the biological child of her parents. Zoe’s father is an earl, and the title is a rare one that can pass to a female child if there is no male heir. Since she has no siblings, she’s in line to inherit, and is very afraid that, if her aunt’s claim is true, a scandal could occur if the knowledge is made public. In order to get a definitive answer, Zoe hires the discreet investigators known as the Duke’s Men to find the truth. Tristan Bonnard is the investigator assigned to her case, much to Zoe’s dismay, as the two had a previous, somewhat antagonistic encounter. However, the trail leads to gypsies, who were friends with Tristan as a child, so he is the logical man to handle the questioning. Tristan is the illegitimate son of a deceased viscount. Years ago, at his father’s deathbed, his legitimate half-brother destroyed a document bequeathing him some valuables, and tossed him and his mother and sister off the property where they had been living. This forced Tristan, at the tender age of seventeen, to be responsible for the welfare of his family. So, now, he has no love for the noble class, and has become somewhat of a scoundrel. Right from the start, sparks are flying between Zoe and Tristan. They each battle the attraction in their own way – Zoe doesn’t show Tristan much respect at the beginning, and acts the part of the snooty countess. He, in turn, refuses to acknowledge her superior social status, and constantly baits her. Soon, whenever they stop bickering long enough, they are stealing kisses. I liked these two characters very much, as it’s clear they are both wearing masks, and just trying to protect themselves. I found myself totally engrossed in this book, hating to put it down. There is a lot more that turns up in the search for the truth about Zoe’s birth, and it has ties to Tristan’s own childhood. Sabrina Jeffries has crafted a very well written story, where the unanswered questions keep you on the edge of your seat. There is also an odious villain, who finally gets his due. The main focus, though, is the romance. The scoundrel, Tristan, became a different man as he fell in love, and he turned into a true hero. The resolution was particularly satisfying because of the hard knocks he endured earlier in life. This is the third book in the Duke’s Men series, and it can be read as a standalone, but there are related characters in the first two books. In particular, reading book one, What the Duke Desires, will provide more insight into this story. 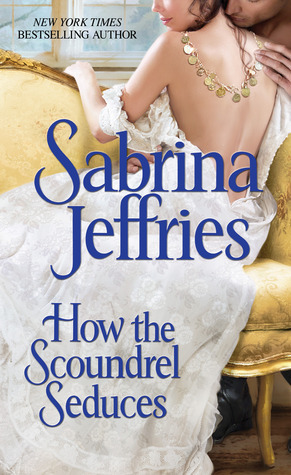 I found this to be one of Sabrina Jeffries’ most enjoyable books – and I recommend it for her fans, as well as all historical romance lovers who enjoy a well plotted, exciting and romantic read. As reviewed for The Season for Romance.